This is the 10 ft cable. 20 and 30 ft cables are sold below. 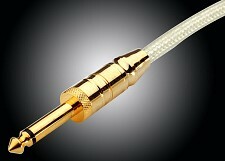 Compare to ANY "Boutique" high end cable out there- WE HAVE!! A remarkably high end guitar cable. The UK made cables feature 20 gauge Silver Plated, Oxygen Free Pure Copper center conductors, silver plated copper helical shield, double PVC insulation and a very thick PVC clear wrap. These cables are completely resistant to handling noise, RF interference, and all other forms of ambient noise. Super low impedance cables- these provide maximum clarity, minimum signal loss and an extremely flat frequency response, even in longer lengths. The gold plated solid brass "Monster" style plugs are super heavy duty- this cable is all about overkill!